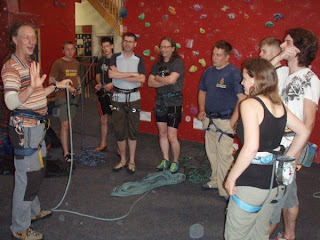 I joined Dave Hooper this week, who is a mountain instructor like myself, to help run a Climbing Wall Award (CWA) training course. The two days where run at Awesome Walls in Liverpool and Stockport. Though our paths have crossed several times over the years, this is the first time Dave and I have had the opportunity to work together. 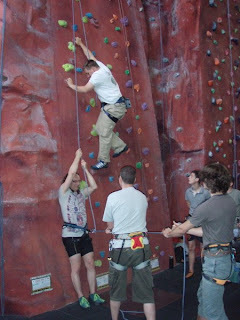 The CWA is a relatively new and nationally recognised award from the MLTUK and is intended for climbers, youth workers and teachers with experience of indoor climbing who are in a position of responsibility, supervising activities on climbing walls and abseil towers. 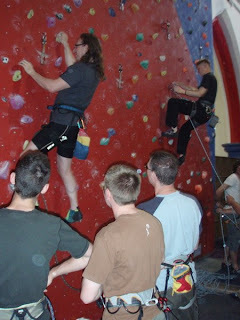 The award is about demonstrating good practice to add to the enjoyment of the activity and covers personal climbing, supervising and management of climbing activities such as bouldering, the teaching of basic movement skills and roped climbing (but not lead climbing). 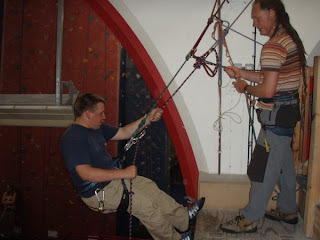 Most courses also include an optional abseil module, which can be run over an evening, for those wishing to run such sessions from artificial structures.